His Beatitude Theodoros II of Alexandria, is the current Pope and Patriarch of Alexandria and All Africa. He was elected following the untimely accidental death of Patriarch Petros VII. The future patriarch was born Nikolaos Choreftakis on the island of Crete in 1954. Nikolaos completed his early education in schools on Crete. Continuing his education, he graduated from the Rizarios Ecclesiastical School in Athens and earned a degree from the Theological Faculty of the Aristotelian University of Thessalonica. He also studied the history of art, literature, and philosophy in Odessa. Having taken monastic vows and receiving the name Theodoros, he was ordained a deacon. From 1975 to 1985, Dn. Theodoros served as archdeacon and chancellor of the holy Metropolis of Lambis and Sfakion in Crete. Here he developed significant preaching and philanthropic activities, such as at hostels for needy youth. From 1985 to 1990, during the tenure of Patriarchs Nicholas VI and Parthenios as Patriarchs of Alexandria, he served as Patriarchal Exarch in Russia, based in Odessa, Ukraine. There he established the Institution of Hellenic Culture and the Philiki Eteria Museum where 600 children were taught a thorough knowledge of Greek. In 1990, he was consecrated bishop with the title of the formerly distinguished Diocese of Kyrēnē with the added appointment as representative of Patr. Parthenios in Athens. In this position he always accompanied Patr. Parthenios on his travels throughout Africa and to many international, interfaith, and Theological conferences. 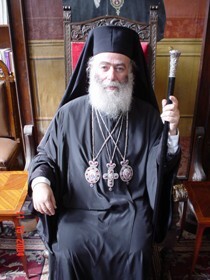 In 1997, he was appointed Patriarchal Vicar by Patriarch Petros VII, to assist the new patriarch at the outset of his patriarchate. Ten months later Bp. Theodoros was elected Metropolitan of Cameroon. As the leader of this missionary diocese, Metr. Theodoros greatly expanded the missionary activity in the diocese. He encouraged the building of churches, schools, and hospitals, as well as helping many Africans and Hellenes. In 2002, Metr. Theodoros was transferred to the holy Metropolis of Zimbabwe, where he established four missionary centers in Harare, a Hellenic Cultural Center that could hold 400 delegates, two large missionary centers in Malawi, with a hospital, technical schools, and nursery schools. Aided by the Greek Parliament he renovated the Hellenic Square (School-Church-Vicarage) in Beira, Mozambique. He founded churches and contributed to the establishment of the Hellenic Communities of Botswana and Angola. On October 9, 2004, Metr. Theodoros was unanimously elected by the Synod of the Alexandrian Throne as Pope and Patriarch of Alexandria and All Africa, succeeding Patriarch Petros VII who was tragically killed in a helicopter accident. The enthronement ceremony took place at the Cathedral of Annunciation in Alexandria, on October 24, 2004. Present were distinguished ecclesiastical and civilian representatives and great number of faithful. His general missionary activity, as well as his affable character, are the reason behind the love felt towards him by all Africans, as well as by the communities of the Hellenes and Arabs of Egypt and All Africa. This page was last edited on December 25, 2017, at 10:11. This page has been accessed 52,735 times.